Cigar Asylum Cigar Forum - What are you reading? No, most historians believe he crossed them in specially constructed rafts. There are a lot of theories on the subject, but most agree with some form of boat. Although there are a fair amount of folks who think the elephant part of the story is myth. No elephant remains have ever been found in the alps. That is true....and I doubt he went to the trouble to return them to Africa...so there would be elephants in Italy. Finished Exit Music-one of the best Rebus stories ever. Now I am reading Don't Know Much about History, by Kenneth C. Davis. Wonderful book so far...interesting to see some of our myths debunked. I still want to know if Washington stood up in the boat as they crossed the Delaware. That's just it. There are so many theories about how, where, and if. Nobody is sure exactly where Hannibal crossed into Italy and it was only just recently that archaeologists found a camp in southern Campania that they believe is Carthaginian in nature. Meyers? Are they any good? I read The Host this summer-best book I read this year. Cryptonomicon. My second time through, I really enjoy this one. Next up is the 2nd half of T.E. Lawrence's Seven Pillars of Wisdom. I am sure glad I stumbled onto the is thread! I read alot and am happy to find a spot here where I can get some ideas for new books and share some of what I have read. For our annual Convention for work I just finished the 360 Leader - it is a rehashing of the other 20+ business books about the same subject. If you have not read any other business books it is a good read but extremely basic if you have :2. Yep. It's an amazing series, one of the most engrossing books I've read in a while. Waiting for the movie to come out in November now. I haven't read The Host yet but I'll definitely have to tell the wife and pick it up. I read one of his books-haunted, I think, about the writers locked up in an old theatre. It was twisted. Are all his books like that? He writes some intense stuff, yeah, I guess you could call some of it twisted. It's interesting how it adapted to film. Just finished reading "playing for pizza"..A John Grisham's book..very unlike his other books as it is not about lawyer stuff which I like. Great book in my opinion as I'm a huge football fan. I'm also a JG fan..I started reading "the brethren"...so far so good.. great concept for this website too..
Just finished Playing for Pizza Annie. A quick read. Have you read Bleachers? Read that a couple years ago. Both quite good. Just finished The Darkest Evening of the year By Dean Koonts. I'm not a fan of Koontz or Stephen King (although I did like The Stand; The Shining film was good too, never read the novel) No offense to your read. Did you enjoy it? The Shining is about my family... I just love reading the opening line to the book: "Jack Torrence was an officious prick..." Truly a Torrence family memoir. a text message...I know, quite educational. I just started Kill Bin Laden, a firsthand account of the hunt for Usama Bin Laden by the elite Delta Force in December of 2001 in the Tora Bora mountain range of Afganistan. A few years ago, I joined the Hard Case Crime Book Club, which reprints paperback crime novels from WWII to 1960, and also has current authors write in that pulp style. They're great, quick reads. Some of the authors so far have been Erle Stanley Gardner, Mickey Spillane, Lawrence Block, Elmore Leonard, and Stephen King. The covers have original art in pulp style by guys like Robert McGinnis and Glen Orbik. 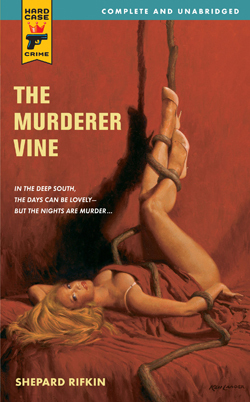 Right now I'm a few months behind, and I'm reading The Murderer Vine by Shepard Rifkin.